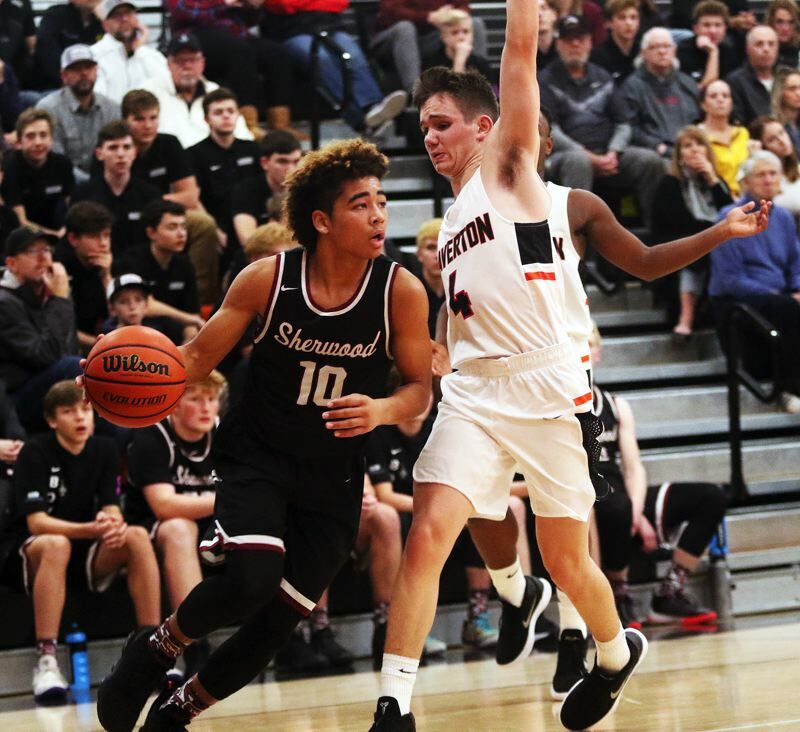 BEAVERTON — The Sherwood High School boys basketball team was hoping to get off to a successful start to the 2018-19 season. Well, the opening few minutes of the Bowmen's season-opener against Beaverton was anything but successful. But, when the game to an end, the Sherwood team was smiling — and celebrating its first win of the season. 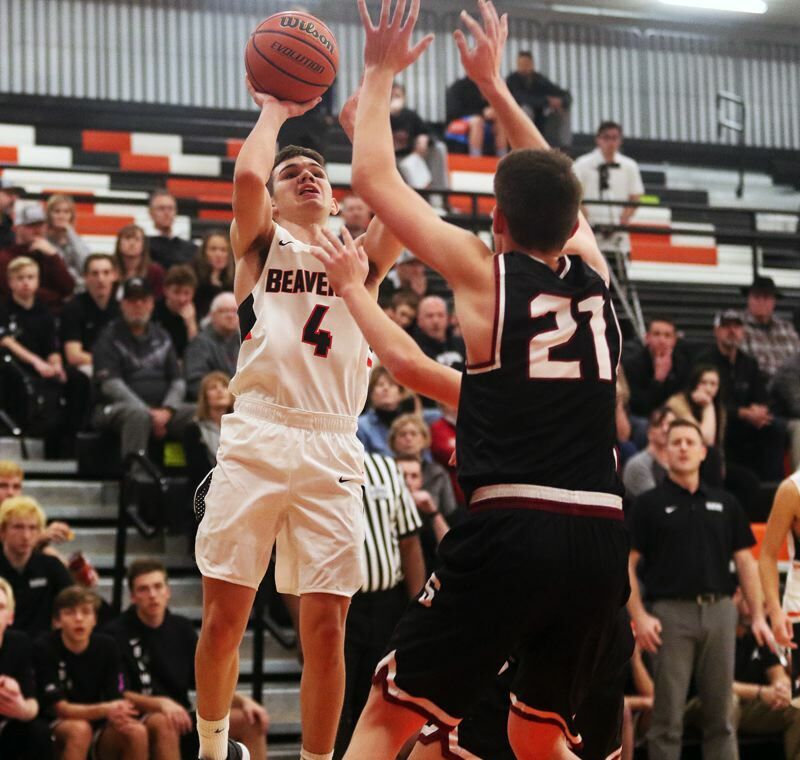 The Bowmen, after missing their first 10 shots from the field to open the contest, came roaring back to score a 64-56 win over the Beavers in a non-league game played Friday at Beaverton High School. "That was so much fun — first game," said Sherwood senior wing Braden Thorn, who scored 12 points in the contest. "Oh yeah, this game was important. Winning it was huge." "It was pretty good," said Sherwood sophomore guard Asher Krauel, who led all scorers with 17 points. "We battled a lot, got our hands up and knocked down some shots. It was a good win — a good team win." And, it's a win that gave the Bowmen a 1-0 start to the season. "Starting off 1-0 feels so good," Thorn said. Meanwhile, Beaverton will look to rebound from its 0-1 start to the season. "For a first game, it was less we expected," Beaver junior wing John Oleson said. "We were a little tentative at the start. They were playing that weird defense, a 1-2-2, and we didn't attack enough. But it's just the first game, and we won't keep our heads down. We'll bounce back." 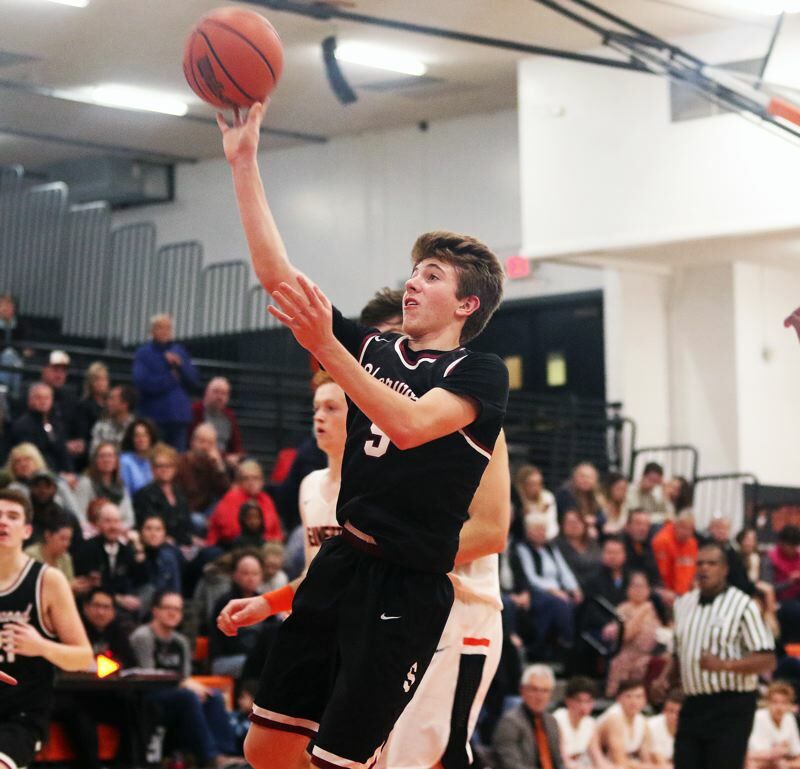 Sherwood, in Friday's opener, took a 2-0 lead after senior post Charlie Bulfinch sank both of his free throws after he was fouled on a follow-up shot with 6 minutes and 31 seconds left to play in the first quarter. But, that was the main early highlight for the Bowmen, who missed their first 10 shots from the field. 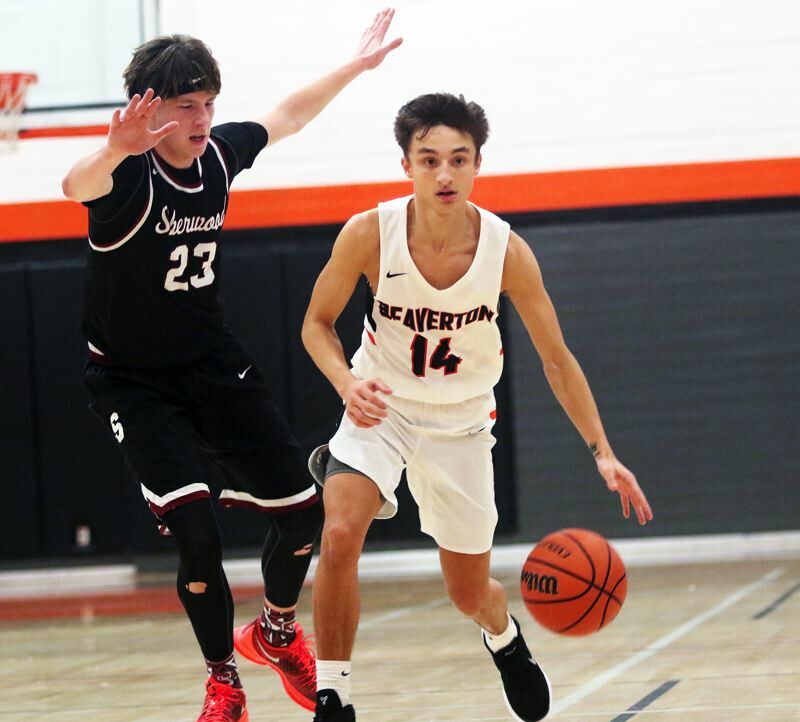 Beaverton, getting a three-point basket from Oleson, and a layup by senior guard Isaac Rosenthal, jumped out to a 5-2 lead with 5:02 left in the first quarter. The Beaverton lead was a 10-6 after junior Bennett Giebles sank a pair of free throws with 1:46 left in the period. But Sherwood, with Krauel sinking a three-pointer off an assist from junior guard Jamison Guerra, trimmed the margin to 10-9 going into the second quarter. That's when the Bowmen took charge. Sherwood opened the period with a three-pointer by senior Ryan Sandilands, coming off a pass from junior Blake Jensen, and a basket on a drive by Guerra, giving the visitors a 14-10 advantage with 6:39 remaining before halftime. Later in the quarter, Sherwood got consecutive hoops from Bulfinch, Thorn and Jensen to open up a 20-13 lead. 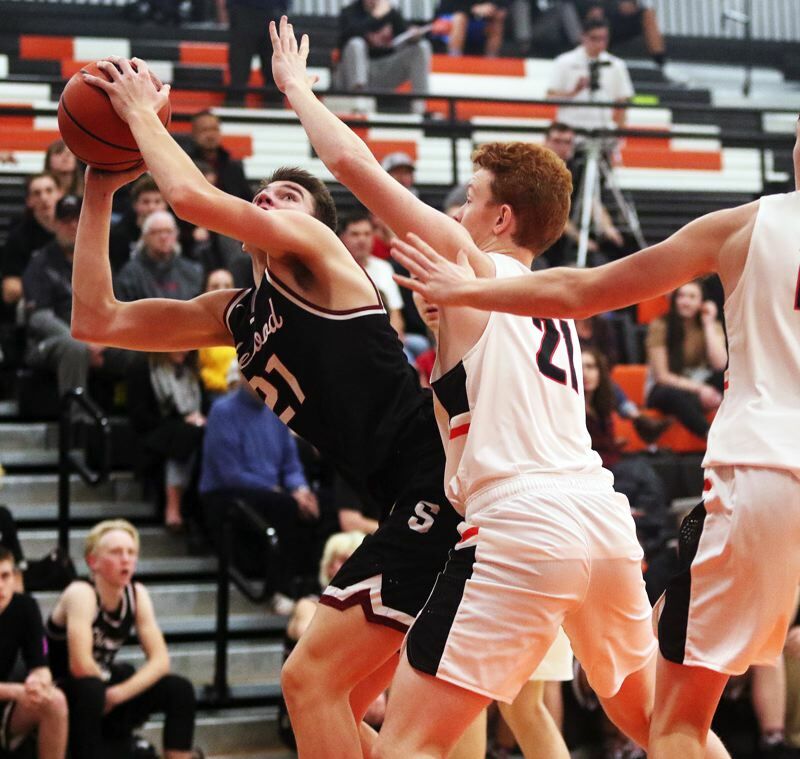 The Bowmen would add on another three-pointer from Sandilands, and Guerra finished the period with four straight free throws, giving Sherwood a 29-18 halftime lead. "Our theme of the week was toughness, so we wanted to play tougher than they did," Thorn said of the turnaround. "So we wanted to beat them mentally and physically. The first half, we jumped on them, got the 'O' boards, played faster and played smarter." The third quarter saw Sherwood take its biggest lead of the game, at 35-22, when Thorn sank a turnaround jumper with 5:16 left in the period. But the Beavers battled back. Beaverton, getting five straight points from Giebles, and a basket on a drive by sophomore Ams Juwara, trimmed the margin to 37-32 with 4:28 left in the period. 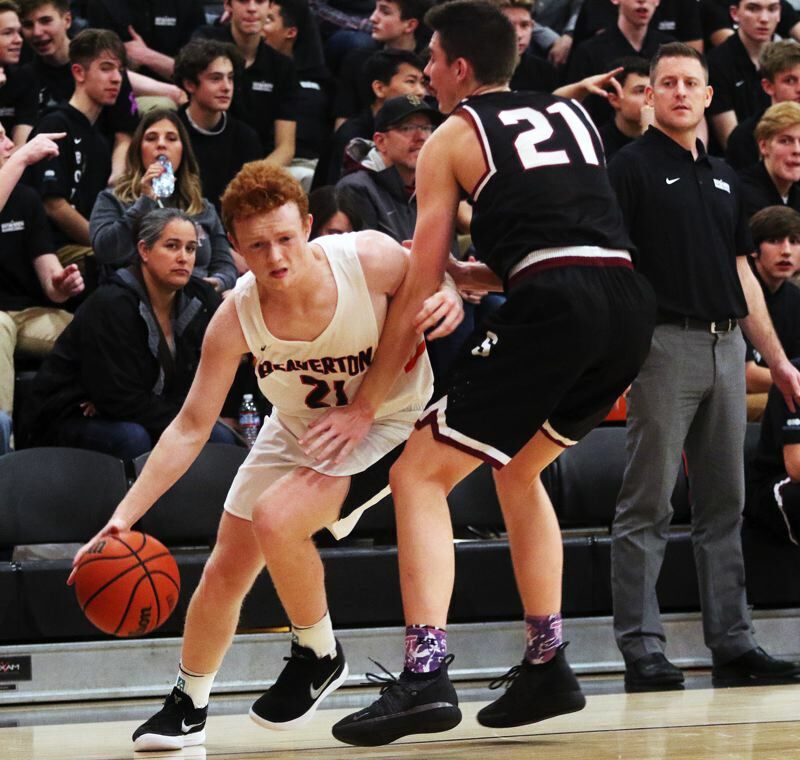 Sherwood responded with a 7-0 run, which included a pair of baskets by Krauel and a follow-up hoop by Jensen, giving the Bowmen a 43-32 lead going into the fourth quarter. But Beaverton came battling back again in the final stanza. Oleson sank back-to-back three-pointers to cut the Sherwood lead to 47-44 with 4:29 left in the contest. "I had a tough night shooting, but making those two shots felt good," Oleson said. "I was just trying to help my team any way I could." Sherwood answered back again. A pair of free throws by Krauel and another three-pointer by Sandilands pushed the lead to 52-44 with 3:43 remaining. From there, Krauel sank a three-pointer and a pair of free throws, Bulfinch, who had a big night on the offensive boards for Sherwood, scored on a follow-up shot and Guerra sank three free throws in the final 40 seconds to help the Bowmen wrap up the 64-56 victory. "It was good to come out and compete against a top-tier team like this," Krauel said. "We've been preparing a long time for this, and we came out and did what we were supposed to do." "Asher Krauel came alive, and showed us what's up," Thorn said. "It's a new team, but I think we played well together. We learned that we can compete with anyone. The game's never over and we can compete." Krauel scored 10 of his game-high 17 points in the fourth quarter of the contest. Thorn had four rebounds and three assists to go with his 12 points. Guerra added 12 points, four steals and three assists. Jensen had six points and six rebounds. Sandilands scored nine points and Bulfinch had eight. Sherwood, as a team, made 22 of 54 shots from the field, with five three-pointers, and 15 of 19 free-throw attempts. The Bowmen also outrebounded Beaverton by a 36-23 margin. Giebles led Beaverton with 15 points. Oleson had seven rebounds to go with his 14 points. Rosenthal had 13 points and six rebounds. 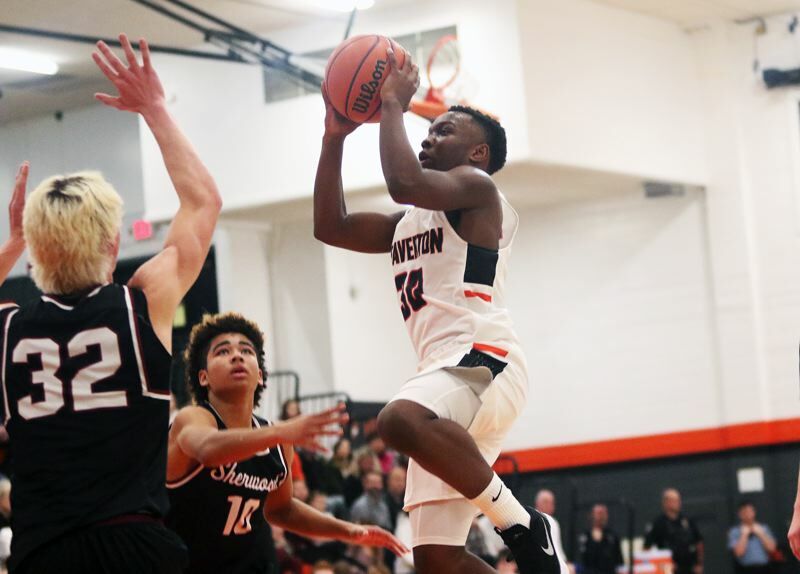 Beaverton, as a team, made 18 of 48 shots from the field, with eight three-pointer, and 12 of 16 free-throw attempts. "We learned that we have to get it from the jump. We have to start quick. We can't just let them control the pace of the game," Oleson said. "We didn't really hit that many shots, and that was probably the main reason we lost. We just had a tough time converting. The couple runs we had was the best basketball we played." 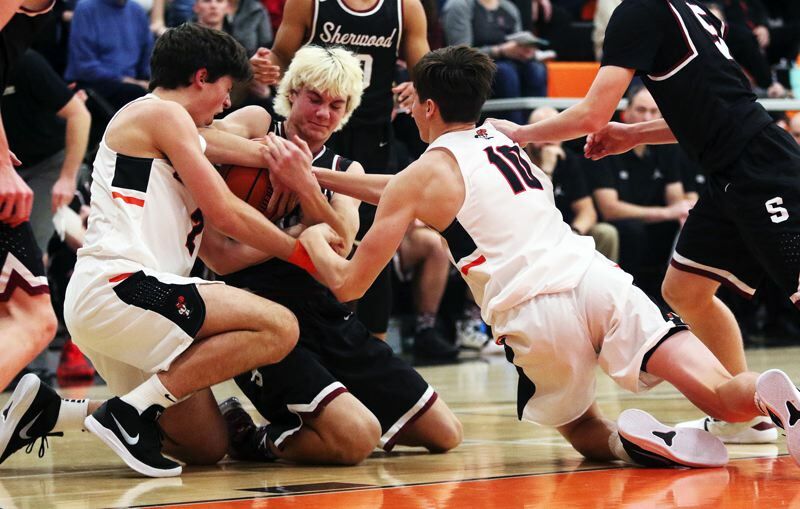 On Saturday, the Bowmen were edged 71-69 by Roosevelt in a non-league game played at Sherwood High School. On Tuesday, Sherwood will play at David Douglas and Beaverton will travel to Century for non-league games starting at 7 p.m.